Text and photographs kindly supplied by Jean Paul Gires (Paris, France). Vaudrimesnil. I know Vaudrimesnil very well -- it belonged to my family up to 1960 and my father was its owner the last years. The true name was "Château de la Rivière-Barbey " [Castle of the River Barbey], but it was often called "Château de Vaudrimesnil." We always refer to it as "Château de Vaudrimesnil " or, more simply, "Vaudrimesnil." It was a "manor" originally. The central part was constructed at the beginning of the 17th century, perhaps a little before. The stairway to the turret of the principal facade (see Figures 2 and 3 below) is very old. Vaudrimesnil became a "château" in the 19th century by the addition of two wings. It entered into the heritage of the Gossets in the first half of the 18th century, was lived in by "Gossets" up to 1916, and remained with descendants (of other surname) up to 1960. The photo on the homepage is from 1922, I think. One can distinguish to the left two women in black. These were the owners of the era, my great-aunts Marie Gires (my Godmother) and Charlotte Gires. They carried on the mourning of their brother, Roger Gires, killed in the war in November of 1914. 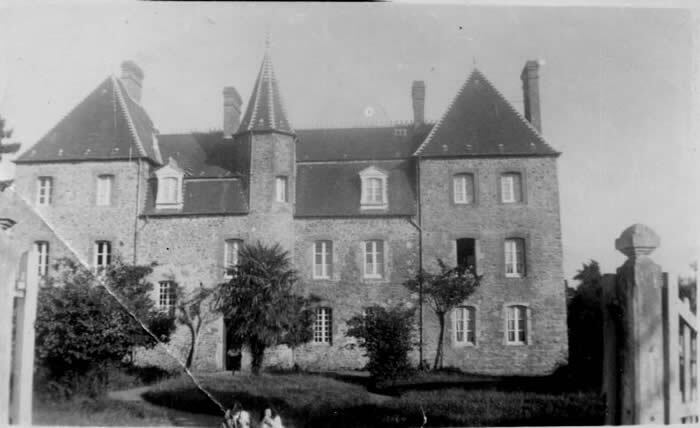 Currently, this is a house for blind persons; it took on the name of "Manoir Guénier," the name of the donor who gave the money for its purchase. Click here for more information about the property's re-purposing. Gossets. The Gossets were not initially native to Vaudrimesnil, but from Carantilly, a small village in the department of Manche, next to Saint-Lô. It is from Carantilly that in 1685 the Huguenot Jean Gosset left for Jersey. 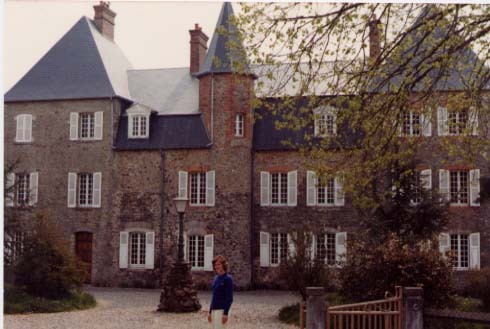 The Gosset property in Carantilly, "La Monnerie," still exists. Better still, it belongs to a descendant of the Gossets. WWII. The Château de Vaudrimesnil was occupied by the Germans from the beginning of June 1944, then by the Americans. It was not destroyed. My aunt Charlotte Gires, who feared it would be bombed, had evacuated its very beautiful, 18th-century furniture – which did end up being destroyed. La Monnerie, though located right in the center of the big American offensive of July 1944, was also miraculously saved. Figure 1. (1913). 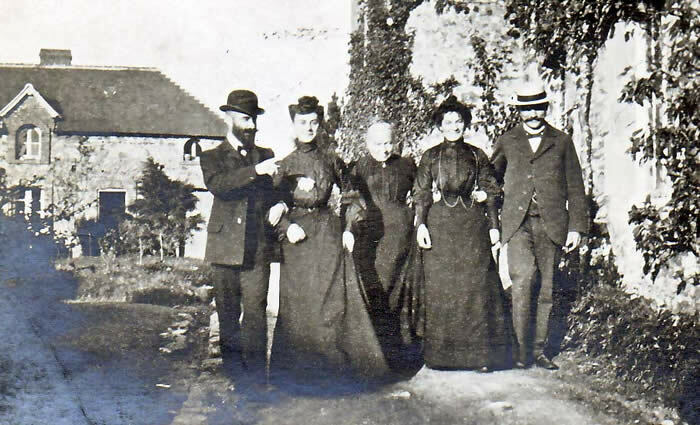 To the center of the group of the five persons is Célina Gosset, last owner carrying the name of Gosset; to right, the principal facade of the château; to the left, the lodge (or caretaker's house), that still exists. For a little history: to the left, my uncle Paul Gires who did his studies of dentistry at the University of Philadelphia in the 1890s and went on to found in Paris the French School of Dentistry. Figure 2. (1930). The principal or entry facade with its interior stairway turret. Figure 3. (1970). The entry facade, after the restorations following the war.